Time has turned the many Norman castles around this country town into romantic ruins; though there was nothing sentimental about the vicious fighters who built them. But even if Churchill rightly observed that history is written by the victors, the underdog’s version of events survives in the case of The Long Man of Kilfane, a stone effigy in a nearby 14th Century church that is said to be the largest of its kind in Britain or Ireland. It is believed to be Thomas de Cantwell, of the Norman family who were Lords of Kilfane and adjoining areas. Apparently, the reason why Cantwell terrorised Irish families, such as the O’Brennans, O’Nolans and MacMurroughts, was because of his unhappy marriage. The story goes that Cantwell and his Italian wife, Beatrice Donati, lost that loving feeling soon after he took her back to his castle. Beatrice became buddies with the infamous Alice Kyteler, who was subsequently arrested for witchcraft. 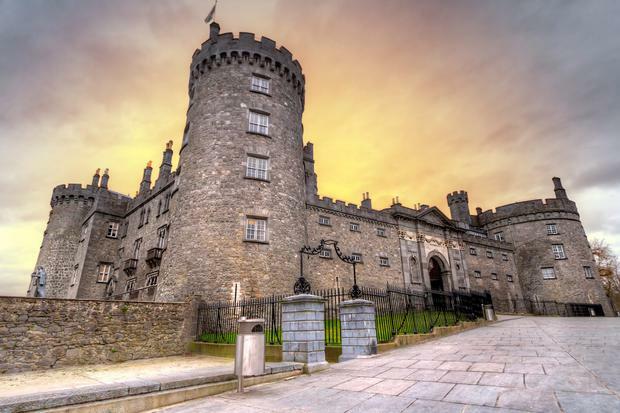 Guilty by association, Beatrice was also thrown into the dungeons of Kilkenny Castle but managed to escape with her accomplice, Oliver De La Freine. However, they were captured by Cantwell and De La Freine killed, but not before Beatrice fatally stabbed her husband with a gold hairpin, thus ending the lamentably short story of the long man who was unlucky in love. Except some things don’t add up in this tale that casts Cantwell as a victim of a vile wife. Because Beatrice wasn’t exactly blessed either, given she apparently subsequently committed suicide. While there is something unsettling about the fact that it was Cantwell who imprisoned his wife and indeed hunted her down after she managed to escape. So it was satisfying to find another slant on the sorry saga, which depicts Cantwell as a typically wealthy young man of the medieval times who went on a crusade. Giving him time to indulge in an amorous adventure in Italy with Beatrice, having, as a contemporary account describes it, “become infatuated with her beauty”. While it was Cantwell who tired of Beatrice, leaving this young woman to befriend Alice Kyteler, a woman who allowed no man to mess with her. And if hell hath no fury like a woman scorned, what about Cantwell brutally murdering De La Freine, the lover of the wife that he no longer wanted? Beatrice admitted killing Cantwell in what could surely be considered self-defence, bravely refusing to call herself a witch. Far from being passive, she took stock of her limited choices while her accusers discussed whether to execute her or burn her, denying them any further control over her destiny by taking her own life. Maybe Beatrice’s hairpin was the only thing that literally ever pierced the cold Cantwell’s heart. And just as schoolchildren were sometimes punished by having to kiss his effigy, maybe that was when a devastated Beatrice Donati realised that his heart was as hard as the stone that would one day immortalise him.